For the past two weeks, the fourth graders in our Hall of Heroes comic book club have been studying the art of comics creation. From word balloons, to panel size and placement, to context clues in the art, our students are looking at comics from the side of the creator rather than the reader. Sure, we want the kids to be personal and expressive and create their own products. That's important. However, we have other specific academic implications at play as well. By studying how writers and illustrators create their craft for readers students discover the layers of literature that make reading so powerful. It's an end-run to teaching inference, context clues, and author's purpose. We ask: "Why did the illustrator draw it like that?" "Why is that there?" "What does this tell us about the author's intent? What was he or she trying to tell you?" "Can you do that? Give it a try." 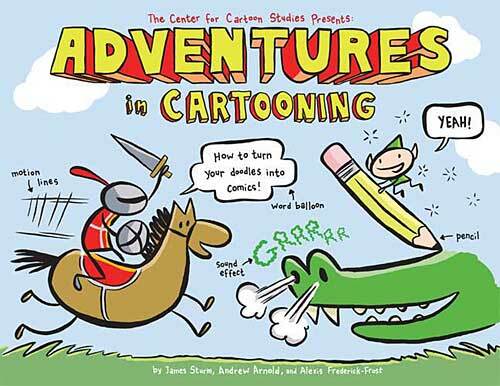 We are using ADVENTURES IN CARTOON, my single favorite comics creator textbook for kids. The kids love it. I simply throw it onto the Smart Board using a document camera and we explore storytelling, stopping every so often and giving them a chance to try it out. How do you make a character look like they are running? How do creators show movement of time? How do they hide clues in the text and art? Then the kids go home and practice, knowing we will publish their comics on this website. While we practice what good readers do when reading, by showing them the back-side, we can explore how good authors and illustrators help readers be ... well, good readers. A combined front-side and back-side approach to literacy solidifies the learning especially for struggling readers. If you’re looking for an exciting new literacy activity this year why not start a daily 20-minute comic strip segment during which your students create a comic diary about something they learned, read, or experienced that day? Creating such daily comix diaries provides a way for youngsters to digest and integrate key material they are taught as well as to reflect on their lives and experiences. What better way to improve writing, reading and storytelling skills! To help educators, MakeBeliefsComix.com, the free online comic strip generator, has launched a Daily Comix Diary page. Students can use the online comic strip generator or draw their own comics with pencil or crayons (stick figures are great), or use pictures cut from magazines. By making their own comic strips, students will realize they can create stories and make art. They will learn that they, too, are capable of generating their own learning materials, their own memoirs, and validate their own take on the world –– everyone sees things differently. WHAT TO DRAW AND WRITE ABOUT? For starters, why not have students create autobiographical comic strips detailing themselves and their families or summarizing the most important things about their lives? Let each student select a cartoon character as a surrogate to represent him or her. They might also summarize what their individual interests are or some key moments in their lives. 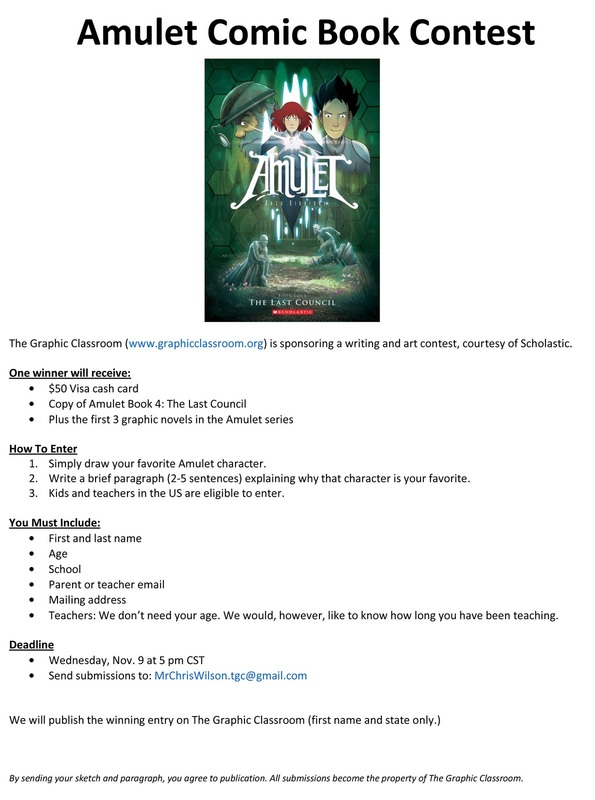 Maybe students create a comic strip with a new ending for a book that they’ve read, or an extension of the story, or a deeper exploration of a character in the book. Maybe their comic is about a concept they learned in science or in social studies. Maybe their comic captures an interesting conversation they overheard. Maybe their comic is about something sad or bad that happened to them, such as someone bullying them. Or about something special, such as a birthday wish. Maybe their comic is about something fun or wonderful that they or a friend experienced – perhaps an adventure they had. Or, about a great or important memory they will never forget. Maybe their daily comic contains a joke they heard or something funny a parent said to them recently. Maybe they’re exploring a problem at home that’s bothering them, such as a sibling who’s driving them crazy. Maybe theirs is a comic strip utilizing new vocabulary learned that day. Maybe their comic strip is a fantasy story that came to their imagination. Or, how about creating a political comic strip commenting on some new development in government or a news event? Now, imagine the student’s comic-filled sketch book or folder containing daily diary entries created over the course of a year that will trace each child’s thoughts and learning reflecting what was important to her or him. They’ll have composed a comic book diary they will treasure for the rest of their lives. Most important, the 20-minute-a-day Daily Comix Diary Challenge offers students the chance to become creators as they find their voice, rather than just passive learners. What better gift can you give them? I opened up a package the other day and in it was a huge textbook, Modern Literature: Rhetorical and Relevant, and there, on page 505, is a graphic novel review I did for The Graphic Classroom. The review is for the book AFTER 911: AMERICA’S WAR ON TERROR, which I liked but found to have some shortcomings. What gets me is who else is in this textbook collection broken down into themes of social justice, identity, global issues and more. I am squished in this tome with some of my favorite writers, such as Billy Collins, Dave Barry, Annie Dillard, Gary Soto, Sandra Cisneros, Sherman Alexie, Marjane Satrapi and even Ray Bradbury. To be honest, I almost turned down the request for the article because, eh, I wasn’t all that interested in being used by a huge publishing company trying to sell textbooks. But I wanted to get some good PR for my friend, Chris Wilson, at The Graphic Classroom, and I was able to work out a small financial deal from the company. At least, I told myself, I was getting paid for the writing gig. And then I was reading the foreword to the textbook (which I think is mostly targeted for California, but aren’t they all? Or Texas? ), and I realize that one of the advisors behind the book is Kathleen Rowlands, who is the director of the Cal State University Northridge Writing Project. I am always happy to see writing project connections to any work I do. And I don’t even know her. Finally, I started reading the textbook. I know. Who does that? 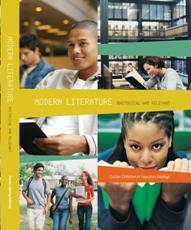 Who reads a textbook unless you have to? But there is some fine stuff in there, and while I mentioned a list of famous folks, there is an entire collection of some incredibly powerful student writing, poems and stories that showcase some amazing talent. Plus, there are comics and other non-traditional texts. That made me happy, too, to know some high school student somewhere has a chance to explore many kinds of text. I can’t say I would run out and buy the book (it probably costs an arm and a leg) if I weren’t in it, but I am quite happy to have it on my bookshelves, knowing my words are sitting comfortably close to some wonderful writers. I hope they don’t mind a little riff-raff in the neighborhood. 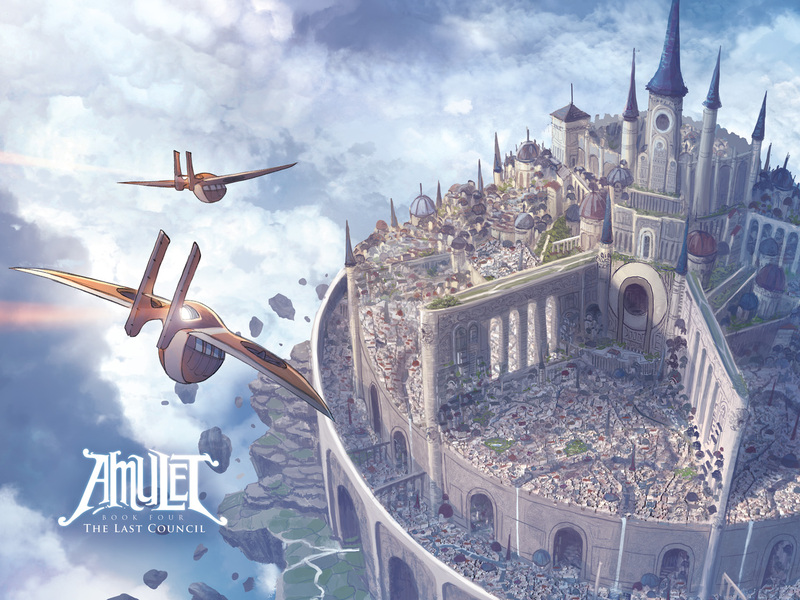 Kabu Kibuishi's New York Times bestselling fantasy and sci-fi comic series, AMULET, has long been a fan favorites in the Hall of Heroes comic book club. Kids rave about it, talk about it, and fight over copies. They just can't get enough. And now ... the new book is out. Watch the trailer. (NOTE: Teachers, we don't need your age, but we would like to know how long you have been teaching. It would make a great addition to your classroom comics library.) All entries become the property of The Graphic Classroom. You can email your sketch to MrChrisWilson.tgc@gmail.com. 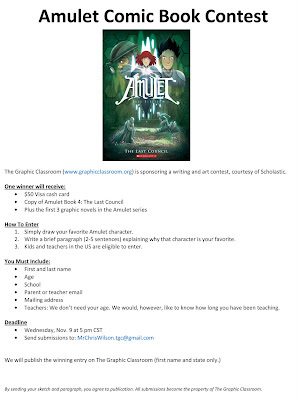 Entries are due Wednesday, November 9 at 5 pm CST. Click on the image above to download the flier for your students. Emily and her friends think they’ll find the help they need in Cielis, but something isn’t right. Streets that were once busy are deserted, and the townspeople who are left live in fear. Emily is soon escorted to the Academy, where she’s expected to compete for a spot on the Guardian Coucil, a group of the most powerful Stonekeepers. But as the number of competitors gets smaller and smaller, an awful secret is slowly uncovered – a secret that, if left buried, means the certain destruction of everything Emily fights for. Murder, treachery, daggers, witches, spells, spirits and suicide –– MACBETH is the classic horror story for Halloween. Stone Arch Books’ Shakespeare Graphics series brings the Bard to life with colorized manga, modern English speckled with original quotes, solid pacing, clear text-art symbiosis, excitement and comprehension. The book begins with a double truck splash page with the cast of characters so the reader can start the story with character understanding. Told in five acts, the reader begins with the witches three and their murderous plot. Each Act is told in modern English with one original Shakespearean quote intact. Visually the quote is bold and larger than the other text, signifying to the reader that this is original language. In the back of the book is a section for the famous quotes. It gives the speaker, the original quote, a modern translation of the quote, and an explanation of the quote. I found that an excellent addition on the part of the publisher and a very helpful section for teachers whose expertise is outside the high school literature classroom as well as for the reader who may be attempting MACBETH on his own. In addition, there are also discussion questions and writing prompts in the back. Despite the modern verbiage, the vocabulary and sentence structure is still complex with overtones of old world syntax. It is not a modern retelling, but merely a translation into more modern English. This was an exciting story, one that will help younger people engage in classic literature and prepare them for the high school and college lit class. With this background knowledge, students will be better prepared to read the original language and spend their time analyzing the intricacies of the Bard, relishing the beauty of his rhyme and meter, and evaluate the deeper themes and implications of his work. F. Daniel uses colorized manga to tell his tale and infuses it with a panel placement that makes the reader stop, ponder, and infer. 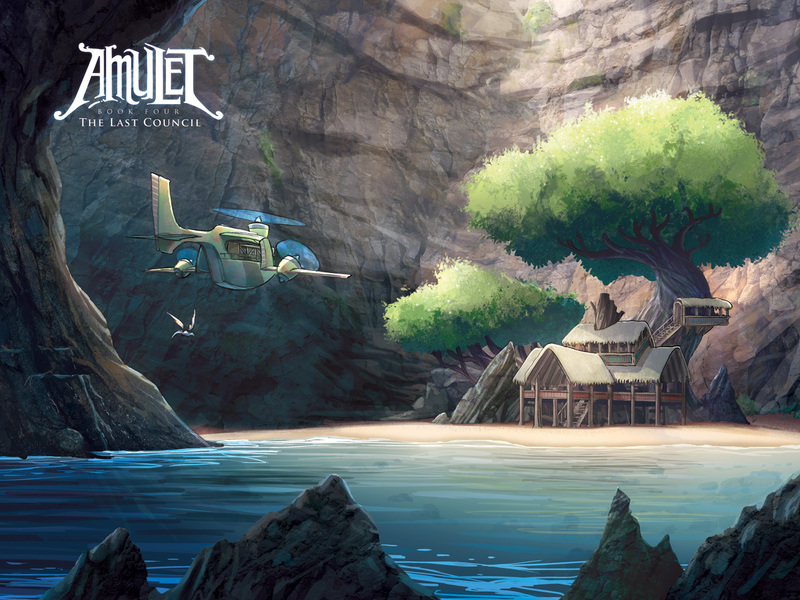 He uses sparse backgrounds to control the focus of the story and keep it firmly on character development. Daniel’s illustrations open an avenue for young readers and struggling older students to appreciate character over action and understand how a character can devolve into tragedy over time. 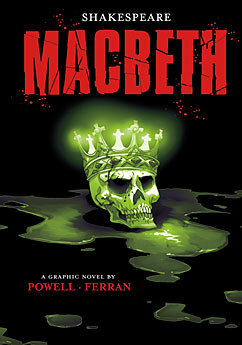 Shakespeare’s MACBETH is a tragic story of blood, death, and witchcraft. The spell casters in the story are not cast as heroic protagonists as in the HARRY POTTER series. I suspect those who object to magic in their child’s stories and movies may not object to MACBETH because the magicians are evil. Many years ago educator and author, Rafe Esquith, instilled in me the desire to teach Shakespeare to elementary students. Unlike Esquith, who holds classes before and after the official school day as well as Saturday instruction, I am not ready or able to teach the original Bard to that age group. It would certainly take a concentrated effort of extended school times both during the week and the weekends to accomplish such a beautiful task. 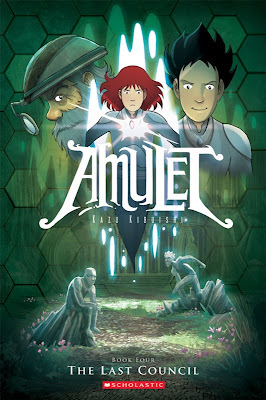 However, my take on Esquith’s work is to teach Shakespeare to elementary or early middle school kids using comics with a variety of textual approaches from original language to modern English. Stone Arch’s MACBETH is a dynamite title from which to launch such an endeavor. I think students could explore the depths of fiction and discover a love for the types of literary deconstruction, evaluation and interpretation that occurs on the high school and college level. It all begins with a basic understanding of language, character, and universal themes. Using a modern English translation with a few original Shakespearean quotes, students can begin to grasp the language of literature and approach classic literature in the high school and college classroom with a different outlook. I admit that the title of this one threw me. Vampires and cells? What the heck! 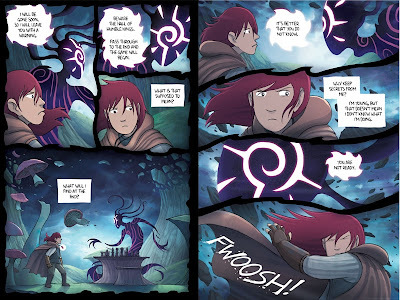 But as I dove into this graphic book in Capstone Press’ Monster Science series, I realized that VAMPIRES AND CELLS and the other titles in the series might be yet another way to bring a fun approach to learning science in the classroom setting. This non-fictional graphic text nicely juxtaposes Dracula and other vampire creatures in the background of panels as a humorous counterpoint to a fairly complex introduction to cells and cell structure in the narration. The text here does not skimp on scientific vocabulary, and I found myself wanting to make sure I pass this book along to my science teacher colleague for her unit on cells later in the year. Much of the art here is rudimentary and basic. But, towards the end of the book, there are a few two-sided pages that feature a full inside look at an animal cell and a plant cell (and a few vampires) is nicely done, very entertaining and educational. It makes me hope that a teacher using VAMPIRES AND CELLS might have an document camera to share the graphic with their students on a large screen. They are beautifully done. The books in this Monster Science series would be right at home in the upper elementary or even middle school classroom. 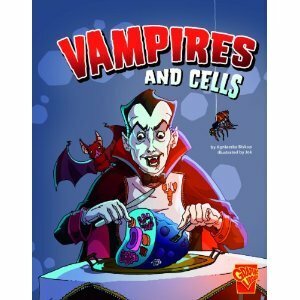 VAMPIRES AND CELLS and the rest are fun ways to introduce or reinforce complicated scientific principles and concepts. You could argue that Dracula has no right being in the same text as endoplasmic reticulum, but … you’d be wrong. I highly recommend this book for upper elementary and middle school classrooms, although the upper end of middle school might be pushing it for reading levels. The book is fun and educational. If you have students whose religion frowns on the mystical or magical, this might be one to avoid (I say this from experience). But there is nothing inappropriate here, other than a few calls for red blood cells by the vampires. 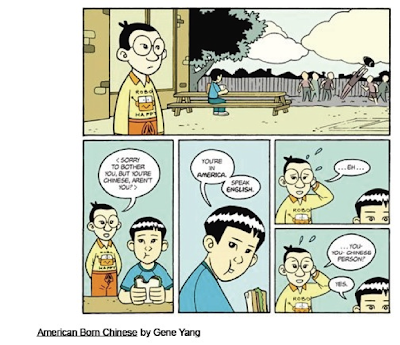 AMERICAN BORN CHINESE is an amazing feat of writing. Gene Yang successfully intertwines three seemingly unrelated stories: The Monkey King, Jin Wang, and Chin Kee. The Monkey King is an allegorical Chinese rendition of the journey made by the famous Chinese monk, Xuan Zang (602-664). The original story has Chinese fables, fairy tales, legends, superstitions, and other Taoist and Buddhist themes. Jin Wang is a new Chinese American student who doesn’t fit in at his predominately White school. He befriends Wei Chen, another Chinese American boy who is struggling with the same. Throughout this story, Jin Wang desperately wants to assimilate and abandon his Chinese culture. Chin Kee is the most stereotypical Chinese person: loud, obnoxious, strong accent. When he visits his cousin Danny –– the epitome of White, high school boys: athletic, popular with girls, etc. –– he is completely embarrassed. Not only does Gene Yang knit these three stories together masterfully, he forces the reader to constantly examine what they are reading and combines it with evidence he has already presented in order to infer what will happen next. The character development is amazing. No character distracts from the overall story of finding acceptance in a world different from theirs. Gene Yang’s illustrations are simple and in color. There is just enough detail to make it look realistic without seeming like a cartoon. Yang illustrates each page in the same sized 4-6 panels. This may not seem relevant, but when introducing fifth graders to the elements of graphic literature (gutters, panels, speech and thought bubbles), this simplicity is very helpful. It is also effective at forcing the reader to slow down while reading. My students may not pick up on this, but I really appreciate the subtle Chinese symbols embedded in each section. Each character’s story has their Chinese pin-yin character stamped on each page in the traditional red-colored dye. Without spoiling the ending, this story could not have been told in straight prose. Characters changing from the beginning of the story to the end could only be told in a graphic novel format. Here is where the fun begins. Depending on the age level of your students, there are tons of applications for AMERICAN BORN CHINESE. You can focus on Chinese mythology, racism, stereotypes, intertwining separate narratives, and character development. 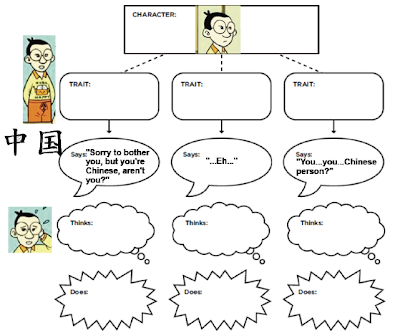 However, for my particular needs, I wanted to use AMERICAN BORN CHINESE to teach the reading strategy of making an inference. Inferencing is a particularly difficult reading strategy to teach. I have always struggled with illustrating how readers need to “read between the lines” and combining your schema (what you already know) with what you read. It is very abstract for students to grasp. 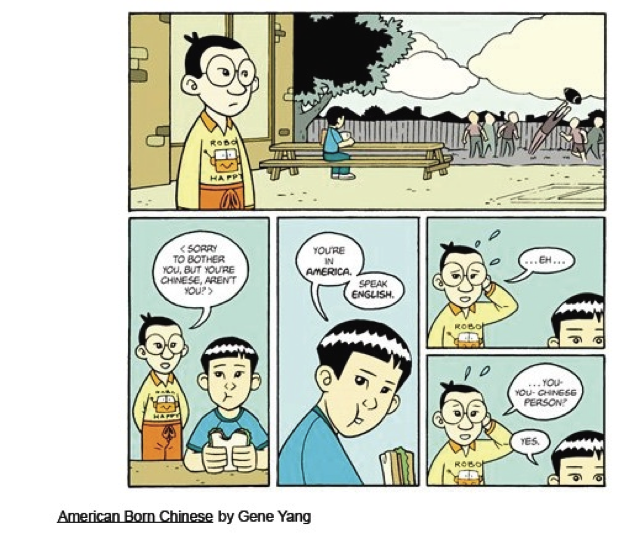 This is why I love using graphic novels to teach reading, especially AMERICAN BORN CHINESE. Since the character development is so strong in this book, I use each character as an example in inferring character traits. For example, on page 37, Wei Chen introduces himself to Jin Wang. This is a perfect opportunity for students to try and discover more about Wei Chen. As a class, we examine Wei’s body language, his speech bubbles, his thought bubbles, his actions (panel illustrations); all to infer what characteristics he possesses. The same chart can be used for any character; and can be modified for making inferences about the setting and plot. In The Monkey King sections, there is a fair amount of new vocabulary for students. Using a simple chart (Table 1), you can have students make inferences for new vocabulary words. 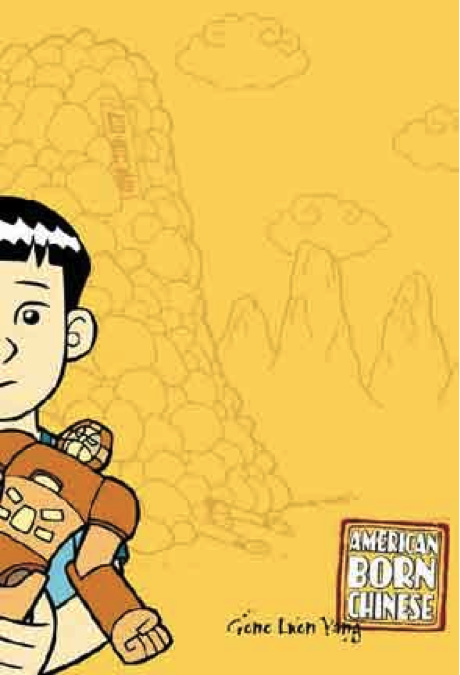 There are a ton of possibilities for using AMERICAN BORN CHINESE in the classroom. Nevertheless, using effective reading strategies for comprehending text is a skill that can be (and should be) taught at any grade level. 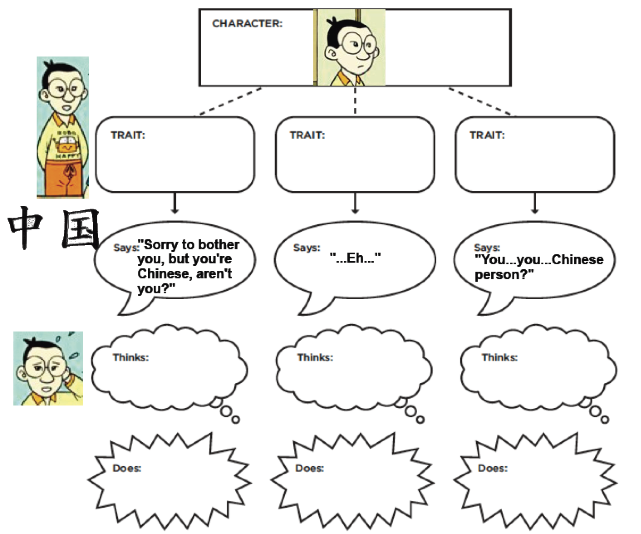 If you are selective about which sections to use in the classroom, AMERICAN BORN CHINESE can be used effectively to teach inferencing in as early as grades 4-5. However, if you intend to teach the entire book, whether as a novel study or lesson in character development throughout the story, I would recommend middle school to high school. There is some occasional profanity (“hell” spoken), cigarette smoking, some gross boy humor, and some bloody violence (when the demons stab the monk on page 148). Although some would disagree, I think it is entirely appropriate to begin conversations in sixth grade classrooms about racial bullying and the idea of having a double consciousness (when one’s identity is divided into two opposing facets). In fifth grade, the discussion may look more like an anti-bullying lesson, but I think middle school students can handle many of the themes presented throughout: humility, fitting in, and one’s identity.